Weird, huh? I know what you’re thinking: It can’t be what you think it might be. NOBODY likes girls. Well, teenagers do, but that’s just gross. And as I recall, you intend to skip that whole phase (we’ll discuss the practicality of that later). OK, so if it’s not about girls, then why did you get that feeling again when Danielle just walked by? This time I saw it. And trust me, I recognize it. First of all, let me say with all the respect and total platonic-ish-ness (It’s my blog and I can make up words if I want to) that one would expect when referring to a 10-year old, she’s a cutie. Good on ya. You used to like girls back when they were just boys that people bought pink stuff for instead of blue stuff. Then you started to learn that they’re different than boys: missing some things and soon to grow other stuff. Yeah, that’s a bit creepy to me too, but you get used to it. Then rumours started to surface on the playground about cooties and kissing, and there was all the weird baby-making stuff that you read about in those books I bought you. 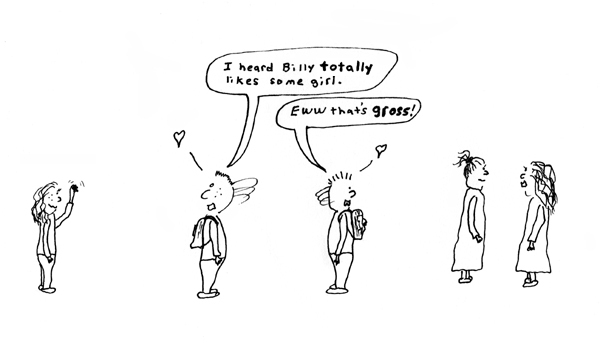 I know it’s all pretty gross, but at some point, you’ll learn to tolerate it. Really, really tolerate it. Somewhere along the way, it became very clear that boys are supposed to hate girls. The idea of kissing one was akin to considering biting into a dog poop sandwich. Just as nobody wants to watch people eat dog poop, nobody wants to watch people kissing. Naturally, then, you covered your eyes while we fast-forwarded through movie kisses. But I caught you peering between your fingers during the kissing scenes in The Princess Bride last week. And then there was that look when Danielle walked by today. So you’re wondering: if boys are supposed to hate girls, what’s wrong with you? Danielle walks by and the weirdness happens. You want to go follow her. When she was calling you a pig-faced dipwad at school today, you couldn’t have been happier. You called her one back because you want your friends to think you hate her with a passion. That’s what’s starting to happen. Not the grown-up gross kind of passion, but the kid kind of passion that bangs around in your gut every time Danielle walks by. You see, you didn’t call her a pig-faced dipwad back just because you want your friends to think you hate her. You called her one back in an attempt to keep the conversation going as long as possible. Before you start denying it, let me just say that I absolutely do not expect you to admit it to yourself, let alone your dad. See, girls and lying pretty much go hand-in-hand. I’m not saying they’re always lying, but I am saying you will. You have my genes, remember? Lying about girls is a long-standing tradition in our family. At least the immediate family. Well, me, really. It’s a long-standing tradition with me. I’m pretty sure Gramps only knew two girls–his mom and mine–so I really don’t know how much lying he did. I, on the other hand, knew hundreds of them. Maybe more. I was a total chick magnet. Couldn’t keep them off me. OK, see what I did there? Big fat lie. (Not the part about Gramps—I think I pretty much nailed that one). It starts right about now when you lie to yourself about how you feel. After all nobody else feels this way about girls, so you’d be some kind of freak if you did. But of course you don’t, right? And so you’ll lie to your friends, as well. Now the funny thing here is that all your friends are doing the same thing. It’s like politics: all the politicos are running around parroting the party line and don’t believe a word of it. Why are they doing this? Because they think all the other parrots believe in it. Well, they don’t. And your friends don’t actually hate girls either. It’s good, though, because you’ll use your lying-about-girls skills for the rest of your life: First you’ll lie about not liking them; then you’ll lie to your friends about girls liking you; then you’ll lie about what you did with girls under the bleachers; then you’ll lie about how many you dated in college; then you’ll be tempted to lie to girls about how few you dated in college (bad idea, by the way). Given that you’ve got my genes and I’m supposed to be helping you here, let me just say that you’re totally normal. But don’t lie to yourself about it. Passion is a good thing. Just know that even though they’ll die before they admit it right now, your friends all feel the same way. Oh, and one other thing. It’s OK to lie about girls, just don’t lie to them. They know. Trust me, they know. ← Just posted a new batch of my favorite tweets! Perfect for those with a 140 character attention span. We do know. It’s like our superpower. Most guys have to learn that the hard way. The only superpower we have is that we can drink more without getting as drunk. And that just makes it more expensive! Thanks being such a consistent commentor! Cool. Thanks for comming by! Good to have this knowlegde in my back pocket for when my little guy gets older. Hard to imagine him going through this phase since he’s only just a wee babe right now, but if time flies as fast as it has this past year, then I’ll be reaching for that back pocket before I know it! It’s funny, you hear that “grow up fast thing” all the time. It’s actually the only thing that seems consistent across parents. Everything else you hear from parents who’ve “been there” may or may not be true for you. This was really cool! Keep it up. And you sure are right about one thing – We know! We’ve caught you at the lying thing since kindergarten! Great post! I remember telling my parents that I would never get married to a girl. “Girls are gross” and what not.. Later. in my late teens when I told them I was gay, it became more of a “told you so” moment. Gotta love those “I told you so moments”. I remember telling my parents I would never have kids. I’m in my 30’s so my mom is just now starting to think I am serious about it. Hehehe. Way to prove your point! Lying to women is just about the dumbest thing you can do. I’m pretty sure they never ask a question they don’t already know the answer to. It sounds like he’s officially at the stage of his life where 80-90% of the conversation he’ll have for the rest of his life revolves, somehow, around women. Or as I like to call it, the good life. Thanks for coming by Adam! Great post! And I think platonic-ish-ness might just stick. That’d be cool. Some day, some historian will trace the origin of the word to an obscure little blog that inhabited a little corner of the Internet back at the turn of the century. Hey, gotta be famous for something, right? Eventually you’ll have to explain the whole love thing…not love as in ‘infatuation’, but love as in ‘enduring, self-sacrificing’ love…but this is a fun time! My 11yr old, head under duvet cover: I think I might like, ya know, um girls. My 11 year old has started to discover girls, too. I almost wish I could share this with him. I’ve finally understood why I like the theme of your blog (parenting) so much (aside from the wittiness I’ve pointed out before): I for one DO remember what is it like being a kid and it seems that so do you. When I was in elementary school I had a crush on this girl in my class and I like to think she kind of had a thing for me too. We used to hang out together during recess, eat our lunch together and even do some homework together. I asked my parents to send me to religion school so I could see her one more hour a week on Monday afternoons; Never really cared about religion, I just wanted more time with her (give me a break I was 9!) After 5 years (ES in Mexico is 6 years long) her family moved out of Mexico City to another state and we lost track of each other. I kept on thinking about her and once I even tried to find her at her new hometown. No success there. Years went by and I started dating, I thought I was in love many times and even managed to break a couple of hearts (no pride there) I had fun with girls and sometimes I even lied to them (and yes, they always know). At some point I even thought of marrying one! But deep down I always kept a fond memory of that girl, her smile and her eyes (silly huh? what can I say I have a good memory, a memory that sometimes is just too good for it to be healthy). Luckily, along came FB and we connected again now in our early thirties about 3 years ago and are very much in love with each other. No doubt about it: She is (and always was) the one. PS Don’t forget Danielle’s face. You never know. What an awesome story Joaquin! Thanks so much for sharing it. Lots of lessons in this one! Like your blog! Oh parenting, I have two girls who are actually both teenagers. Yikes! Tell him it doesn’t get any easier! And I SO do not envy the parent of two teenage girls. Glad to see you’re surviving! We do know. Bahahaha. Sounds like your getting sonny set straight early on. Bravo! I loved that “really, really tolerate.” Haha! That was awesome and so true. Now if I can just figure out how to flip it around for my little girls. That’d be great. Ooh, yeah, sorry I’m pretty useless with little girl stuff. Let me know how that all works out. Naw they don’t know. We just let them think they do. Anyone care to comment? I think they think they’re letting us think that we’re letting them think they do. I am so glad I checked on Freshly Pressed today! As the mom of an 11 year old boy, I can relate. He was soooo checking out the girls at the beach this summer, but he told me he “heard a noise”. Of course that’s why you turned your head to watch her go by. Of course. Silly mommy. Hahaha! They’re so sincere when they say those things too. “Heard a noise” Hahahaha….Sure, yeah, right. OK. Sorry. I was blogging back then, but I could only make 3 carbon copies at most before having to retype the whole thing. BTW, I love the name “thebilgeucket”! LMAO @ dont lie to them… Trust me,they know! WE do! I tell my sons all the time, If I (or your girlfriend) ask you a question you instinctively feel the desire to LIE about, DONT! We already know the answer…its a trap and we are going to catch you in it. loving these posts! so glad I found this! See, this is why guys only answer somewhere around half the questions you females ask us. We either tell the truth and get our asses kicked or lie and, well, get our asses kicked. Seriously, this Y chromosome is like an automatic no-win scenario right from birth. It’s a curse. You X chromosomers really should be nicer to us. It’s no our fault. Haha this all way tooooo true this is what I keep telling my little brother I can’t wait to show him this! Awesome blog! Glad it rings true for you. Thanks for stopping by!